This is a great article from http://www.listotic.com/. I like the creativity. I have done the door one on my own properties. Nothing changes a first impression like a door that looks new. You only get one chance to make a first impression! I’ve always wondered why the exposed slab foundation on homes are left as such an eyesore!? I suppose it could get pretty pricey to cover the entire foundation of your home, but these faux panels will leave you with some change left in your pockets. They come in faux rock, stone, brick and wood, with several different styles and colors to choose from. These would be great for the inside of the home, too! Perhaps a fireplace surround or accent wall? Leave it to that huge electrical box, piping, and wires to ruin the aesthetics of your home. Paint anything that stands out the same color as your house and they are a lot less noticeable and painful on the eyes. 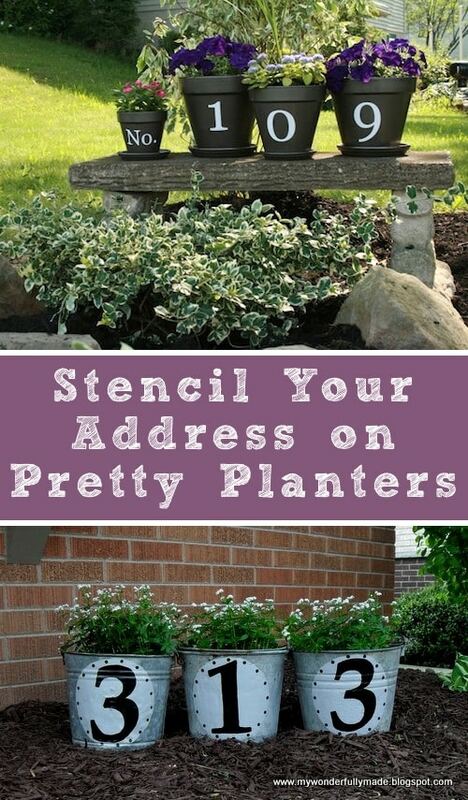 You could also paint other things in the yard the same color as your landscape and surroundings to help them blend in. It’s got a build in umbrella! Why not? My kids would love hanging out on this bench to read, eat a popsicle, or even take a nap. You could also use it to hold potted plants and perhaps a few throw pillows. A lot of times the base of trees have bald spots in the lawn because they lack adequate sun exposure, so this is also a great way to disguise missing grass or exposed roots. 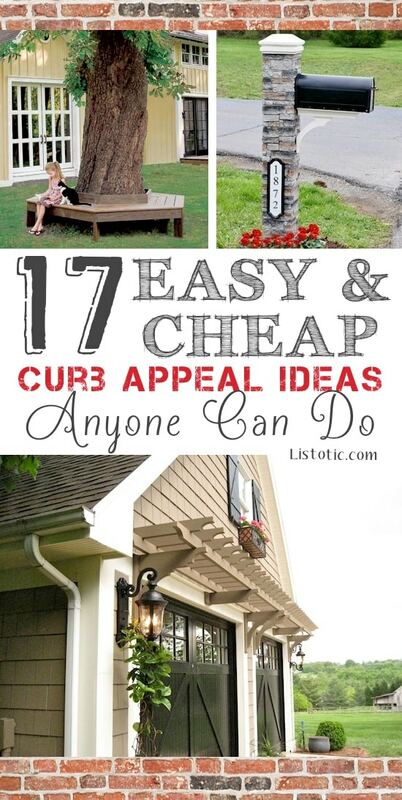 A window box can turn a boring window into one of the home’s best features from the road. Not only will it make the windows appear larger, but it’s almost like bringing a bit of nature inside because you can see all of the flowers and plants from the interior of the home, too. The mailbox is literally the first impression of your home, and because it is so small, it could be as simple as an afternoon project to get it looking like it came straight out of a luxury home catalog. This one is actually a cast stone post surround that can be placed over a 4×4 wooden post, so it’s much easier than it looks! Even something as simple as placing a few pieces of slate down to create a pathway can make your home seem so much more inviting. 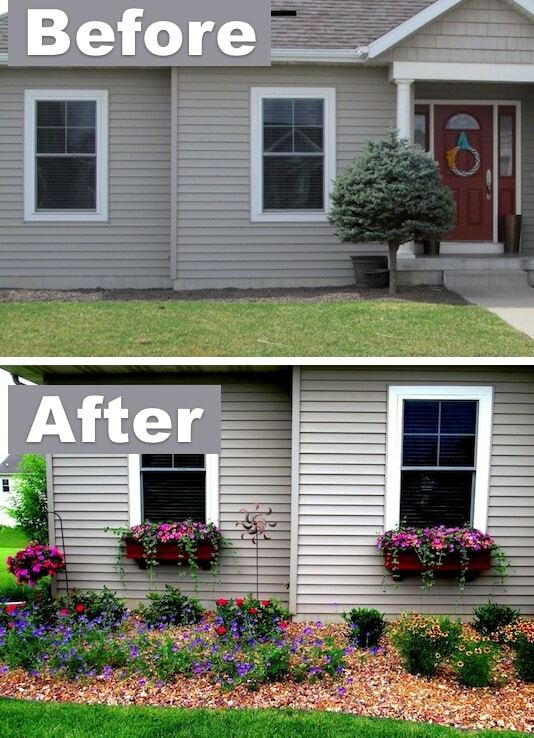 My husband and I did this from the front circle drive to a side area in our yard (so we could stop walking through the grass), and it really made a noticeable difference in the overall look of our home. Small windows got you down? 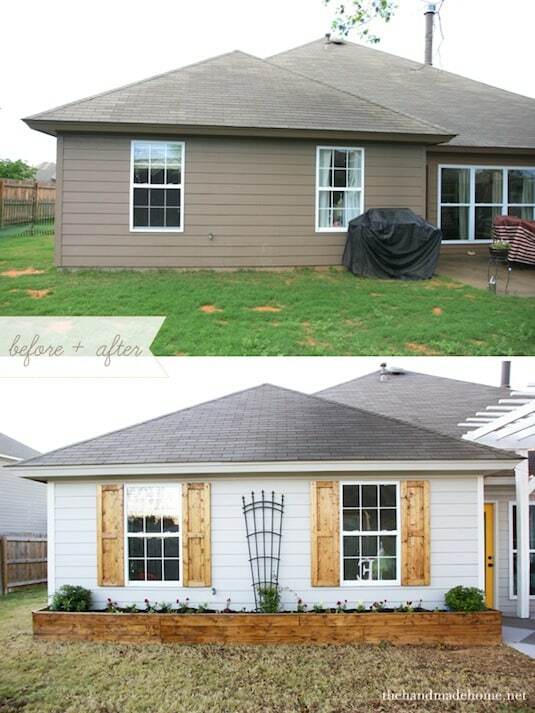 Add shutters to make them look twice their size! This also breaks up a large and boring exterior wall — giving your home lots of visual interest. Choosing a color that is the complete opposite of the color of your home will make them pop even more. For instance, I love the way black shutters look on a white or soft beige colored home. 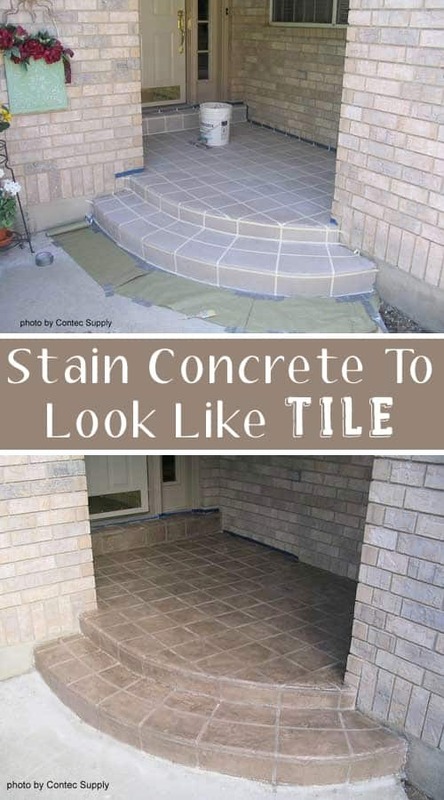 Give your home a fresh and updated look with the creative use of concrete stain! 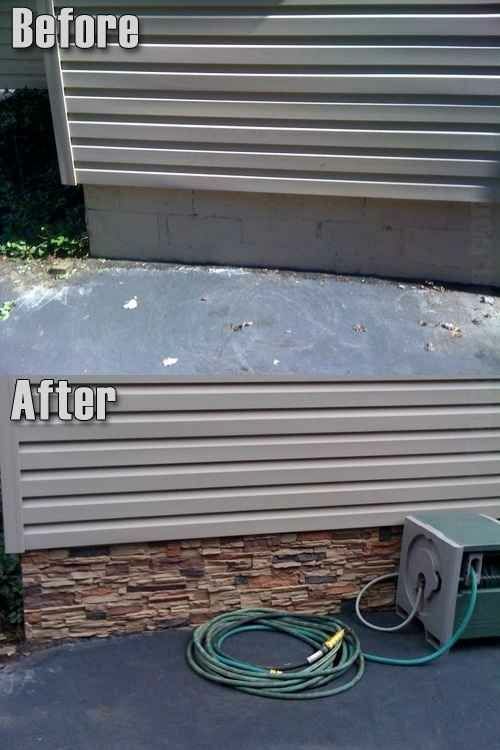 This patio was made to look like tile by using painter’s tape to make faux grout lines. Even just the stain itself can give walkways, patios, and driveways and entirely new look. Earlier this year I went on a hunt for some creative and DIY ways to display my house number. The one I have now is too hard to see from the road. 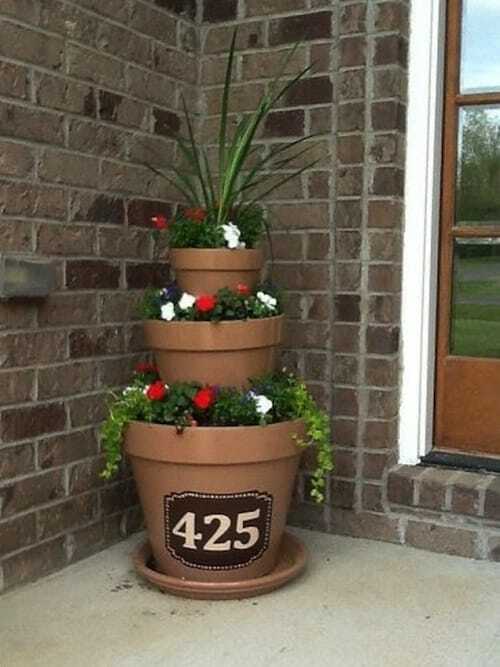 I stumbled across this idea and couldn’t help but love the simplicity of it, yet how pretty it would be to incorporate my address into the garden. I have the perfect little area on the front corner of my yard where I plan to make this happen! 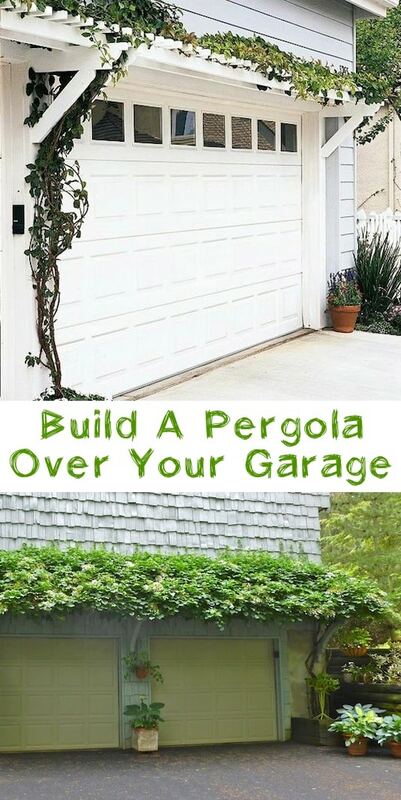 You could build a pergola on just about any part of the house where you want to add a little bit of character. It even looks nice without the vines, but you can’t go wrong with adding a touch of greenery. You would probably have to be vigilant at keeping them pruned, but if you like being out in the garden, this is definitely well worth it. Did you know there is a hardware kit made for this? Too cool! 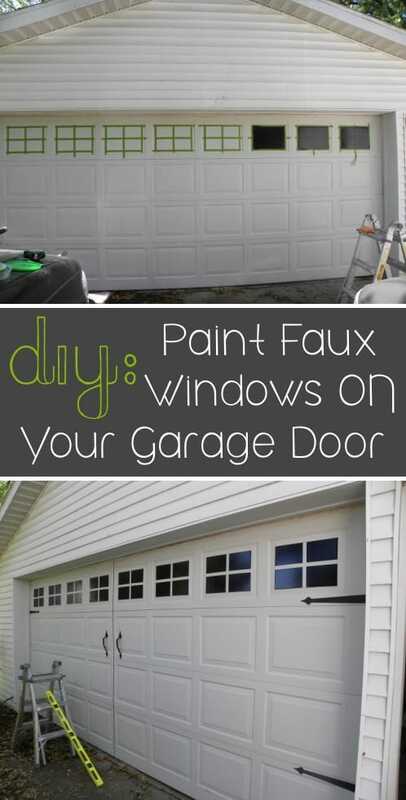 It certainly brings life and character to an otherwise mundane garage. Nothing beats a cheap and easy home project that makes such a big difference. 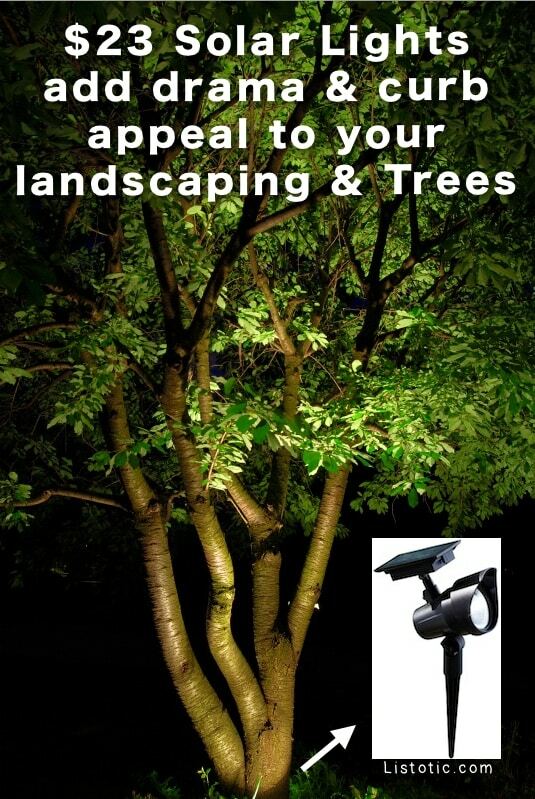 If you have a lot of trees and shrubs, this is the easiest thing you can do to make your home look fabulous at night! I stumbled across these at Home Depot, and ended up buying 4 of them. I have 2 of them shining on trees, and the others shining on these huge boulders we have in the front yard. They make the yard look amazing at night, and because they are solar powered, there’s no added expense to your electric bill. They also have them available with the solar panel attached with a long wire so you can place it quite a distance away from the spot light where it might get more sun during the day. They actually make a pot for this! I suppose the only difference is there’s a small hole for the hose in the back so it can be connected to the water faucet. What a fantastic way to keep it out of sight yet easy to access and use. 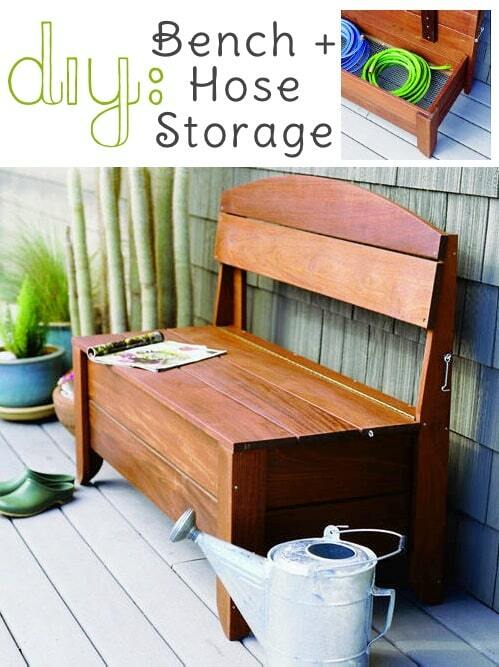 I’m also really digging the idea of keeping one hidden in a storage bench — build one or just drill a hole large enough to fit your hose in the back of an already existing one. I can imagine the hardest part of this project is getting the tape level and straight, but aside from that, it is certainly easier than replacing it! 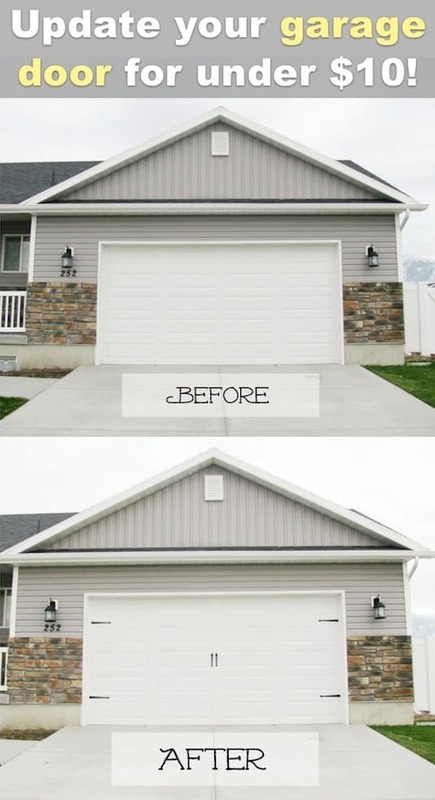 It looks particularly good on this garage door because it sits far back from the road under a lot of shade trees. You would never guess these windows were painted on from the street. This is one of my biggest pet peeves — when big, ugly trash cans are visible from the street, sometimes open with trash bags peeking out of the top. If you are forced to keep your trash where it can easily be seen from the street (or from anywhere really), put up a small fence, or perhaps even build (or buy) a garbage can storage shed. I think even a few lattice panels would do the job.